The co-founder and secretary of the Kochi Biennale Foundation (KBF), Riyas Komu is a multi-media artist and an activist working towards encouraging art education and developing art infrastructure in India. His critically acclaimed political works have been exhibited extensively in India and abroad, which include several key works that focus specially on the political and cultural history of Kerala. 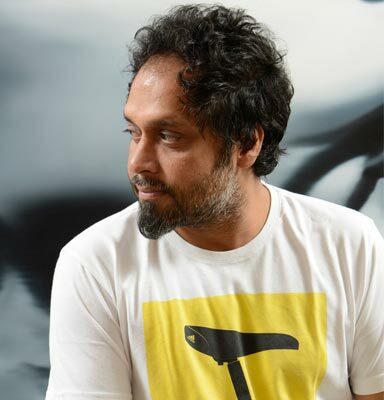 Riyas, who shuttles between Kerala and Mumbai, was one of two artists from India to be selected by curator Robert Storr for the 52nd Venice Biennale in 2007 and he represented the Iranian Pavilion at Venice Biennale in 2015. Having his roots in Kerala, football seems to run in Riyas’s veins as he went on to create significant projects focusing on the game, including Mark Him First Half & Second Half, and Left Legs with the Iraqi National Football Team (2008/2010), Subrato to César 2010, reflecting on the current issues of Indian Football at Gallery Maskara, Mumbai, and Beyond Gods, retrieving the multiculturalism of French football at Centre Pompidou, Paris, as part of their “Paris-Delhi-Bombay” exhibition. In addition to these projects, he co-curated the first ever International football film festival in India at the Goa International Film Festival and Trivandrum International Film festivals in 2012. Being at the helm of KBF he has initiated the Children’s Biennale, Students Biennale and Artists Cinema as part of the Kochi-Muziris Biennale. He is currently working as a director of programmes for the Foundation and also develops projects focusing on Art Education in India.